Should the marks a cat makes be treated as art, or are they simply forms of territorial behavior? This book is an unprecedented photographic record of cat creativity that will intrigue cat lovers and art lovers alike. As far as we know, no theory of feline aesthetics has yet been presented, at least not with such remarkable clarity and thorough documentation. Now, many aspects of heretofore unexplained cat behavior can be understood within the familiar context of art. Reviews of the book are available. in association with The Museum of Non-Primate Art. At last, the book cat-lovers have been waiting for! Following the extraordinary success of the best selling book Why Cats Paint, organisations like the Museum of Non-Primate Art (M.O.N.P.A. ), were swamped with requests for more information from cat lovers around the world. One of the most frequently asked questions was, "How do I know if my cat will paint too?" Now, with Test Your Cat's Creative Intelligence, all cat owners can find the answer to this question. By simply holding up the cards in front of your cat you can discover its creative intelligence (CQ) and determine its potential to create masterly works of non-primate art and even generate an income. These test cards were developed over a three year period by animal behaviorists at M.O.N.P.A. in order to determine and sort creative cats from their non-creative counterparts. Now, largely as a result of the interest shown by people using the cards displayed on this Internet site, best-selling author Burton Silver has collaborated with M.O.N.P.A. to bring this ground-breaking method into every cat lover's home. Scientifically designed for high validity, these cards include all the fundamental tests required to fully ascertain your cat's creative abilities, including: A Color Composition Test, A Brain Dominance Test, An Ink Blot Test, A Color Blindness Test and An Optical Sensation Test. A beautifully produced, high quality address book which is full of stunning paintings by cats matched with their individual portraits and relevent biographical and curatorial notes. A pleasure to use. 8 1/2 x 6 inches, 112 pages, concealed wirebound case, full color. In this special collection, selected by the creators of Why Cats Paint, we offer several of the most unique examples of cat art and artists in a postcard book, allowing readers to share their discovery with friends. These books can all be purchased from reputable bookstores or directly from the publisher, Ten Speed Press. Other books by Burton Silver and Heather Busch can be ordered online at a discount. Please be sure to let any bookstore or publisher you contact as a result of a listing on this page, know that you saw them here. Thanks. Portal Publications have produced a range of Greeting Cards, T.Shirts and Posters which are now available at retail outlets throughout the USA and Canada. In the USA they are always available from national chains such as Pier 1 and Michaels (art and hobby stores) or regional chains like Cost Plus and Waccamaw Pottery. 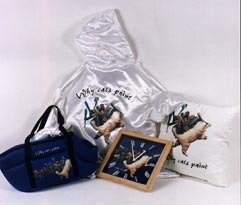 A comprehensive range of merchandise has been developed for Why Cats Paint, Japan Co., Ltd. including clocks, pillows, silk jackets, pet carriers, pyjamas, T-Shirts and watches. You are able to buy these items by mail order or from the Why Cats Paint Shop in central Tokyo which opened in 1996. In Canada Why Cats Paint is distributed by Publishers Group West, in the UK by Weidenfeld & Nicolson, in Australia by Allen & Unwin and in New Zealand by Hodder Moa Beckett. It is also available in South Africa. In Germany, Austria and Switzerland Why Cats Paint is distributed by Benedikt Taschen under the title of, Warum Katzen Malen. In Italy it is available as, Perch*i Gatti dipingono, distributed by Arnoldo Mondadori and in Holland, it is published under the title, Waarom Katten Schilderen by Librero Nederland. In France it goes under the name of, Le Mystere Des Chats Peintres, published by Taschen France and in Portugal it is distributed by Centralivros as, Porque Pintam Os Gatos. In Spain it is distributed by Asppan under the title, Por Que Pintan Los Gatos and in Japan it is published by Taschen Japan based in Osaka.